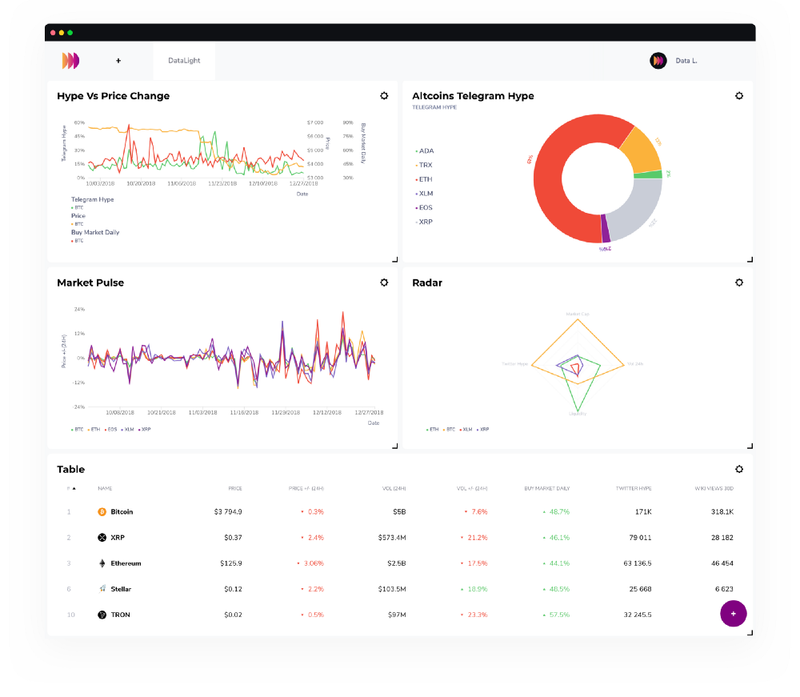 In this tutorial you will find all the information needed to master our amazing tool and create the ultimate crypto monitoring dashboard in DataLight Lab. 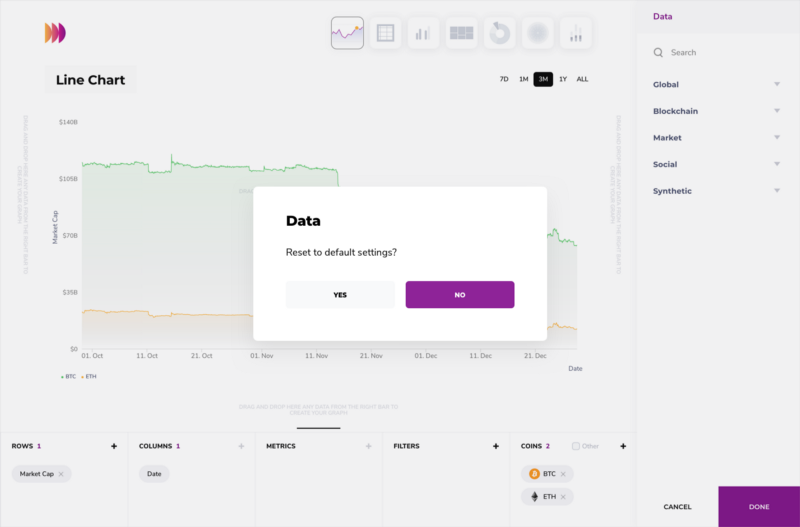 Default Dashboard is a board that has been pre-set by DataLight’s Team of experts. It fits the needs of most crypto enthusiasts. It is ready to use out of the box. We have pre-set a number of graphs for you. For example, on Hype vs Price Change diagram you can see dependence between Hype Index and an asset’s liquidity. 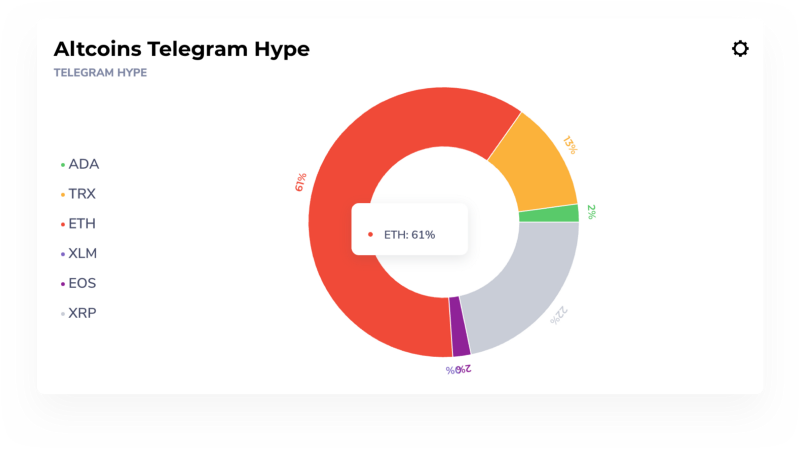 Altcoins Telegram Hype index allows you to see how many people discussed top altcoins on Telegram. You can create your own Dashboards and change any existing one. This is also where you can delete widgets. Let’s add a board and name it! You can edit the existing widgets by pressing a button with a gear on a widget. Press the “+” button in the bottom right corner to add a new custom widget. You can select any kind of available diagrams. For your convenience each kind of diagrams has pre-set data in order to see what this kind of diagram can show. To the right you can see all data represented on our platform. They are divided into groups — Social, Market, Blockchain and Synthetic. Also, you can search the name of an index. Let’s create a widget based on a Line Chart diagram. Please bear in mind that when you drag a metric, available panels of a builder are highlighted in green, while the panels highlighted in red can not be used. If a field is unavailable for a selected kind of a diagram, it loses colour. Let’s drag Hype Index metric to Rows. The graph changes its shape and now we can see the metric we added to it. After you added data, select the assets you want to analyze. Press plus and select necessary coins. You can also quickly remove coins by pressing a cross on a coin’s tag in the panel. Afterwards we suggest setting up more complex filters on a diagram. You should press a plus button in the Filters panel. It should open a pop-up form where you should select a required field (for example, Market Cap). Then we select an operator. Let’s take Bigger and enter 70000000000. It sets a bottom limit for capitalization of 70 billion USD. 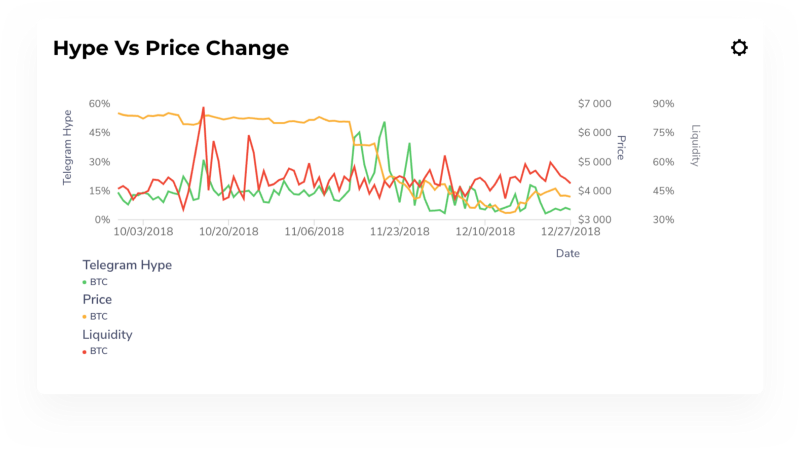 As of December 2018, it will leave only Bitcoin. After you’ve created a diagram, you can change its type. Let’s change Line Chart for Histogram. This way you will be able to determine which kind of graph is more convenient for displaying selected data. If you change a diagram, you will be asked if you want to reset all settings. If you press “Yes” you will get a new type of a diagram with default settings. If you choose “No” a new kind of a diagram will attempt displaying previously selected data. Please beware that some diagrams are incompatible and can not display the same data. Above a diagram you can see 1D 1W 3M — this is a time period for data display. After that you can change the name of a widget. After you press “Done”, your widget will be added to the dashboard. If you don’t see it, scroll down to find it in the lower part of your dashboard. During Alpha testing there can be some issues with the widget builder. If you find something that needs fixing, just let us know and we’ll sort it out!